January 10, 2001. 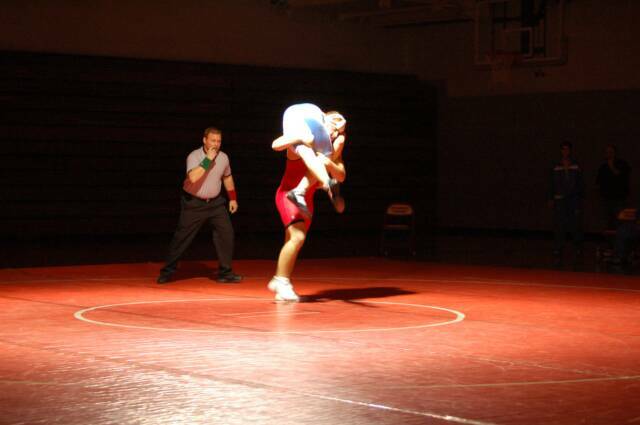 This Weyauwega Wrestling Web Site was selected "Web's Best" in Amateur Wrestling, by a National Ranking Service. November 30, 2010. Weyauwega Wrestling Web Site changed to archive previous year's information and create space for this year. December 12, 2009. Other teams are scouting our team based on this website. Therefore, I will not be updating many items until after the season. Sorry. December 12, 2009. I am starting to enter this year's information and pictures into the computer. Please be patient. Thank you. All-Time Career Wins: Casey Haase, a Senior, is currently in 14th place with 91 career wins and only 17 losses. Jared Gruetzmacher, a Junior, is currently in 28th place with 72 career wins and only 18 losses. Dylan Hansen, a Senior, is currently in 32nd place with 69 career wins and only 45 losses. All-Time Season Wins: Jared Gruetzmacher ended his Freshman year two year's ago in 2nd place with 41 wins and only 6 losses, Casey Haase earned 4th place with 38 wins and only 4 losses. Two years ago, Casey Haase ended his Sophomore year in 32nd place with 30 wins and only 5 losses. Last year, Dylan Hansen earned 16th place with 33 wins and only 13 losses. All-Time Career Pins: Casey Haase is currently in 10th place with 52 career pins. Dylan Hansen is currently in 23rd place with 38 career pins. Jared Gruetzmacher is currently in 28th place with 34 career pins. All-Time Season Pins: Casey Haase earned a tie for 2nd place with 24 pins last season. Jared Gruetzmacher earned 12th place with 21 pins last season. 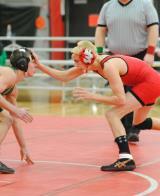 Dylan Hansen earned 19th place with 18 pins last season. Two years ago, Dylan Hansen had 17 pins for 27th place. All-Time Career Takedowns: Casey Haase is currently in 12th place with 131 career takedowns. Dylan Hansen is currently in 29th place with 98 takedowns. All-Time Season Takedowns: Casey Haase ended his Sophomore year two years ago in 20th place with 50 takedowns. Casey Haase ended his Junior year last year in 26th place with 47 takedowns. Dylan Hansen ended his Junior year last year in 30th place with 46 takedowns. Congratulations to these three fine wrestlers. They join an elite group of all-time great wrestlers from Weyauwega-Fremont. November 30, 2010. Only two days until the first meet of the year. Weyauwega-Fremont hosts Markesan at 7:00 PM. See you in Wega. It's always exciting to start a new season. November 30, 2010. My Internet web host made some major changes and I had to rebuild this whole website. I hope this works. December 2, 2010. The season is underway. A large crowd of fans watched W-F defeat Markesan by a score of 58 to 18. The coaches had the team looked well prepared for the first meet of the 2010-2011 season. The next action is the Little Chute Tournament on Saturday. December 4, 2010. Little Chute Tournament. Two champions. Trevor Potratz won his first varsity tournament and Casey Haase won another in his string of tournament championships. Three wrestlers earned second place spots, Dylan Hansen, Jered Greutzmacher, and Ben Fox. Dylan and Jered both lost heart wrenchers in overtime after questionable referees calls. However, no gripping, both wrestlers will rebound for the next match. It was good to see all of the wrestlers wrestling hard until the very end of every match. This will be a good wrestling season. All-Time Career Wins: Casey Haase, a Senior, is currently in 3rd place with 121 career wins and only 21 losses. Jared Gruetzmacher, a Junior, is currently in 11th place with 103 career wins and only 23 losses. Dylan Hansen, a Senior, is currently in 16th place with 92 career wins and only 53 losses. All-Time Career Pins: Casey Haase is currently in 4th place with 75 career pins. Jared Gruetzmacher is currently in 11th place with 53 pins. Dylan Hansen is currently in 13th place with 51 career pins. All-Time Career Takedowns: Casey Haase is currently in 6th place with 169 career takedowns. Dylan Hansen is currently in 12th place with 136 takedowns. Jared Gruetzmacher is currently in 30th place with 96 takedowns. All-Time Season Wins: Jared Gruetzmacher is currently in 30th place with a record of 31 - 5. Casey Haase is currently in 35th place with a season record of 30 - 4. All-Time Season Pins: Casey Haase is currently in 14th place with 23 pins this season. Jared Gruetzmacher is currently tied for 15th place with 19 pins this season. December 11, 2010. Blizzard. The W-F Akey Duals were cancelled due to a snow blizzard. Some other teams' athletic directors got cold feet. This is the first time I ever showed up at a wrestling tournament in the winter and I was the only one in the parking lot. I never considered that a wrestling tournament would be cancelled due to natural winter weather conditions. December 18, 2010. Green Bay Preble. The coaches added a new tournament to replace the Akey Duals. This tournament was in a Scramble format. W-F had two champions, Jared Gruetzmacher and Casey Haase. Placing 3rd was Trevor Potratz and 5th was Brandon Loehrke and Mike Nelson. Check is out at Trackwrestling.com and search for Green Bay and go to the Willard Schmidt Scramble. December 18, 2010. CASEY HAASE. Casey Haase reached a major milestone. Casey pinned his opponent in the Green Bay Preble Scramble for his 100th win. CONGRATULATIONS. At the end of the day, Casey's record of 102 wins and only 17 losses puts Casey Haase in the the TOP TEN all-time at W-F.
January 22, 2011. JARED GRUETZMACHER. Jared earned his 100th individual win at the CWC conference duals. Jared is one of an elite group of 14 Weyauwega-Fremont wrestlers. Jared's current record of 102 wins and only 23 losses puts him in 11th place on the All-Time Wins list. Jared is only a Junior. CONGRATULATIONS. February 5, 2011. CWC Tournament. Wow! W-F placed 2nd which combined with the 7 - 1 CWC Dual Team record makes Weyauwega-Fremont the CO-CHAMPION of the Central Wisconsin Conference! Bonduel is the other Co-Champion for the 2010-2011 season. Individual champions for Weyauwega-Fremont were Dylan Hansen at 119#, Jared Gruetzmacher at 125#, and Jacob Chmielewski at 171#. Placing second were Trevor Potratz at 130# and Casey Haase at 189#. The conference championship was a real team effort with every wrestler placing in the top six in their respective class. February 12, 2011. DYLAN HANSEN. Dylan earned his 100th individual win at the WIAA Division III Regionals in Weyauwega. Dylan is the 3rd Weyauwega-Fremont wrestler to reach this milestone this season. Dylan's current record of 100 - 53 puts him in 14th place on the All-Time Wins list. Dylan is a Senior. CONGRATULATIONS. February 12, 2011. WIAA Division III Regionals at Weyauwega. W-F had a great day and nine wrestlers placed 1st or 2nd to earn a trip to the WIAA Sectionals next weekend. W-F placed 2nd as a Team. Congratulations to Isaac Danke (2nd), Dylan Hansen (1st), Jared Gruetzmacher (2nd), Trevor Potratz (1st), Mike Nelson (2nd), Casey Lenz (2nd), Jacob Chmielewski (2nd), Casey Haase (1st), and Nick Stelzner (2nd). February 19, 2011. WIAA Division III Sectionals in Pulaski. Casey Haase won at 189#. Casey pinned an undefeated and highly ranked wrestler for first place and a first round bye at the State Tournament next week. Dylan Hansen qualified for the State Tournament. Dylan, a Senior, will wrestle on Thursday. Congratulations to these wrestlers. Also congratulations to the other seven W-F wrestlers that competed at the Sectionals. February 27, 2011. Madison. Casey Haase is the 2011 WIAA Division III 189# STATE CHAMPION. Congratulations Casey. Casey is only the third wrestler from Weyauwega-Fremont to earn the right to stand on the top step of the podium in front of a packed crowd at Madison. The other two wrestlers were Corey Baehnman in 1995 and Brian Loehrke in 1999, both at 103#. Casey also earned his place at or near the top in many categories of Weyauwega-Fremont All-Time Career Records and All-Time Season Records. All-Time Career Wins: Casey Haase, a Senior, ends his career in 3rd place with 133 wins and only 23 losses. Casey ends his career as WIAA Division III 189# State Champion. Jared Gruetzmacher, a Junior, is currently in 7th place with 108 career wins and only 25 losses. Dylan Hansen, a Senior, ends his career in 14th place with 102 career wins and only 56 losses plus Dylan was a State Qualifier at 119#. Trevor Potratz, a Sophomore, joins the All-Time Career Wins list in 47th place with 55 wins and only 23 losses. All-Time Season Wins: Casey Haase, a Senior, ends his career in 1st place with 42 wins and only 6 losses. Casey's Junior year record of 38 - 4 is 5th place and Casey's Sophomore year record of 30 - 5 is 38th place. Jared Gruetzmacher ends his Junior year in 10th place with 36 wins and only 7 losses. Jared's Freshman year record of 41 - 6 is currently in 3rd place and his Sophomore year record of 31 - 12 is in 36th place. Trevor Potratz, a Sophomore, is in 16th place with 34 wins and only 11 losses. Dylan Hansen, a Senior, ends his career in 19th place with 33 wins and only 11 losses. Dylan's Junior year record of 33 - 13 is in 20th place. All-Time Career Pins: Casey Haase, a Senior, ends his career in 2nd place with 82 pins, only one behind the All-Time Career Pin leader, Brian Loehrke. Dylan Hansen, a Senior, ends his career in 9th place with 54 pins. Jared Gruetzmacher, a Junior, is tied with Dylan for 9th place with 54 pins. All-Time Season Pins: Casey Haase, a Senior, ends his career in 1st place with 30 pins, one more than Brian Loehrke. Casey's Junior year was 24 pins and 3rd place. Jared Guetzmacher, a Junior, is in 15th palce with 20 pins plus is in 13th place with his Sophomore year's 21 pins. Dylan Hansen is in 21st place for his Junior year's 18 pins and 25th place with his Sophomore year's 17 pins. All-Time Career Takedowns: Casey Haase, a Senior, ends his career in 4th place with 186 takedowns. Dylan Hansen, a Senior, ends his career in 7th place with 154 takedowns. Jared Gruetzmacher, a Junior, is in 29th place with 100 takedowns. All-Time Season Takedowns: Trevor Potratz, a Sophomore, is in 8th place with 60 takedowns. Dylan Hansen, a Senior, is in 13th place with 56 takedowns. Dylan's Junior year is 34th place with 46 takedowns. Casey Haase, a Senior, is in 16th place with 55 takedowns. Casey's Sophomore year is 23rd place with 50 takedowns. Casey's Junior year is 30th place with 47 takedowns. Mike Nelson, a Senior, is in 25th place with 49 takedowns. Congratulations to these fine wrestlers. They join an elite group of all-time great wrestlers from Weyauwega-Fremont. Summer, 2011. What have our wrestlers been doing during Summer? 1. On June 17 the 2011-2012 wrestling schedules came out and W-F is in DIII next year. We host a regional with Amherst, Manawa, Rosholt, Tri-County, Shiocton and W-F.
2. 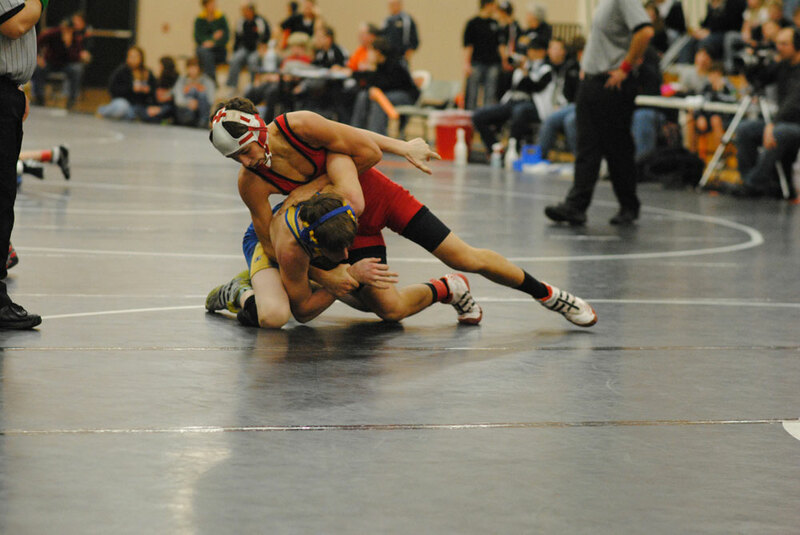 Trevor Potratz placed 4th at 160# at the Northern Plains Freestyle Tournament (8 man bracket) on June 17-18. 3. From June 27-30 twelve W-F wrestlers went to team competition camp for four days in Wisconsin Dells. W-F was 4-4 in duals and placed 36 out of 64 teams in the huge team tournament. We forfeited two weight classes but competed well - lots of team building. 4. On July 12-17 Trevor Potratz went to River Falls, WI and tried out for the Wisconsin Cadet National Team in Greco-Roman style wrestling. Trevor made the team and went to Fargo, ND for the Cadet National Greco-Roman Tournament. Trevor wrestled twice in the tournament at 152#. Wisconsin placed 9th in the national tournament. 5. In August the wrestling team will again be serving the community by parking cars at the Waupaca County Fair here in Weyauwega. December 2, 2011. The 2011-2012 Season is underway. W-F Wrestlers started out with a win over Menominee Indian. December 3, 2011. Little Chute Tournament. W-F placed 4th as a team. December 10, 2012. W-F Akey Duals. W-F beat Ripon 69 to 10; beat Fox Valley Lutheran 57 to 16; beat Chilton 42 to 39; lost to Stratford; and beat Waupaca 48 to 33. Congratulations to all the wrestlers. It was good to see the team hoisting the 2nd place Team Trophy at the end of the day. Which of this year's wrestlers are on the Weyauwega-Fremont All Time Career List and/or the Weyauwega-Fremont All-Time Season List? All-Time Career Wins: Jared Gruetzmacher, a Senior, has jumped to FIRST PLACE with 144 career wins and only 33 losses. Trevor Potratz, a Junior, has moved up on the All-Time Career Wins list to 28th place with 79 wins and only 28 losses. All-Time Season Wins: Jared Gruetzmacher ended up his Senior year in 11th place with a record of 36 - 8. Jared's Freshman year record of 41 - 6 is in 3rd place and his Sophomore year record of 31 - 12 is in 36th place. Jared's Junior year record of 36 - 7 is in 10th place. Trevor Potratz' Sophomore year record is in 16th place with 34 wins and only 11 losses. All-Time Career Pins: Jared Gruetzmacher, a Senior, is currently in 5th place with 73 pins. Trevor Potratz, a Junior, is currently in 29th place with 35 pins. All-Time Season Pins: A new entry to the All-Time List: Allen Bentle, a Senior, is in 13th place with 21 pins. Jared Gruetzmacher's 19 pins this Senior year is in 17th place. Jared's Junior year was in 16th place with 20 pins plus Jared is also in 13th place with his Sophomore year's 21 pins. All-Time Career Takedowns: Jared Gruetzmacher, a Senior, is currently in 13th place with 141 takedowns. Trevor Potratz, a Junior, is currently in 14th place with 136 takedowns. All-Time Season Takedowns: Trevor Potratz, a Junior, is in 34th place with 46 takedowns this season. Last year, Trevor Potratz, garnered 8th place with 60 takedowns. February 4, 2012. CWC Conference Tournament at Shiocton. 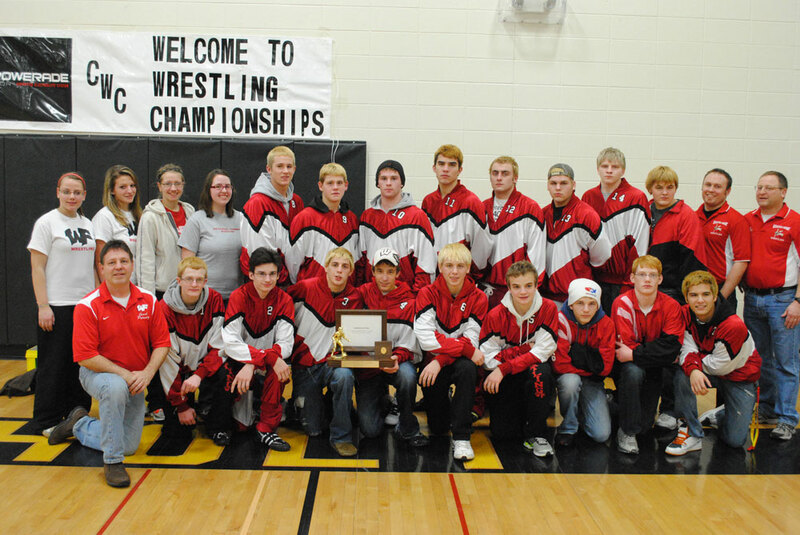 Go to www.Trackwrestling.com and search for city of Shiocton to see all the results of the Conference Tournament. February 12, 2012. CWC Div. III Regionals. Weyauwega. Weyauwega has five wrestlers moving on to Div. III Sectionals in Auburndale next Saturday. The wrestlers are Oliver Radtke, Tre Blohm, Jared Gruetzmacher, Trevor Potratz, and Jordan Haase. February 18, 2012. Div. III Sectionals at Auburndale. Weyauwega-Fremont has two State Qualifiers - Jared Gruetzmacher and Trevor Potratz. Congratulations. Jared Gruetzmacher and Trevor Potratz both competed at State today. Both lost. However, Jared ended his Senior year as the All-Time leader in wins. Trevor is looking forward to next year. So are we. November 29, 2012. The 2012-2013 W-F wrestling schedule can be found on the home page. November 30, 2012. I added a new page with the Historical Fastest Pins from 2000-2001 to 2006-2007 seasons. I changed the opponents' names to just initials because I recently received an email from someone that got pinned quickly years ago. He said that everytime he applies for a job, the company Googles him and his name shows up as being pinned. I never considered the long term ramifications to wrestlers from the other teams. I sincerely apologize to him and all wrestlers that were named as being pinned quickly. Even though TrackWrestling and many newspaper websites have the same historical stats, apparently Google finds the information easier on this website. As wrestlers, most, if not all, of these wrestlers that lost have turned out to be decent and responsible adults. My apologies to the wrestlers from these other teams, their coaches, family, and fans. Good luck in the future. Who were the four W-F wrestlers that pinned their respective opponents in 12 seconds? Which of this year's wrestlers made the Weyauwega-Fremont All Time Career List and/or the Weyauwega-Fremont All-Time Season List? All-Time Career Wins: Trevor Portratz ended his high school career in 15th place with 102 wins and only 33 losses. Brandon Loehrke, a Junior, has moved up on the All-Time Career Wins list to 32nd place with 70 wins and only 50 losses. Oliver Radtke, a Sophomore, ended this season in 47th place with 56 wins and only 24 losses. All-Time Season Wins: Oliver Radtke, a Sophomore, is in 30th place with a record of 32 - 9. Trevor Potratz' Sophomore year record is still in 17th place with 34 wins and only 11 losses. All-Time Career Pins: Trevor Potratz made it to 15th place with 46 pins. All-Time Season Pins: No one has made this list this year. All-Time Career Takedowns: Trevor Potratz, a Senior, made it to 5th place with 182 takedowns in his career. Brandon Loehrke, a Junior, is currently in 22nd place with 119 takedowns in his high school career. All-Time Season Takedowns: Brandon Loehrke, ended his Junior season in 9th place with 59 takedowns. Trevor Potratz, a Junior, earned 35th place with 46 takedowns last season. As a Sophomore, Trevor Potratz, garnered 8th place with 60 takedowns. Brandon has another year to go and Oliver has two more years to increase his career standings. Good luck next year. February 16, 2013. The 2012-2013 wrestling season is over. No one made it to State, although Oliver Radtke, Tre Blohm, Trevor Potratz, and Brandon Loehrke made it to Sectionals. Congratulations. Injuries, grades, and lack of participants defined this season, but the number of Freshmen gaining experience and the number of 8th Graders out for wrestling this year gives us hope for next year. Lift weights, climb ropes, run, and practice for next year. Also, don't forget to do your homework in school. I have not kept the detailed records of the results of each tournament and dual meet this year because most are now available on www.TrackWrestling.com, CWC conference web site, and various news sources online. Thanks to Coach Potratz for providing summary results when requested. Thanks to the wrestlers for another good season. Only 8 1/2 months until the first dual next season. January 5, 2014. Just got some stats for this season. Starting to enter information. Please be patient. The schedule can be found on the Weyauwega-Fremont School District website under High School and Sports. February 22, 2014. Two State Qualifiers: Oliver Radtke, Jr, at 132# and Brandon Loehrke, Sr, at 170#. Brandon earned his 99th, 100th, and 101st wins. Congratulations. All-Time Career Wins: Brandon Loehrke, a Senior, has finished his high school wrestling career and is on the All-Time Career Wins list in 16th place with 101 wins and only 60 losses. Oliver Radtke, a Junior, is currently in 27th place with 81 wins and 37 losses. All-Time Season Wins: Brandon Loehrke, a Senior, is in 38th place with a record of 31 - 10. Oliver Radtke earned 30th place with a record of 32 - 10 last year as a Sophomore. All-Time Career Pins: Brandon Loehrke made it to 28th place with 37 pins. All-Time Career Takedowns: TOP TEN: Brandon Loehrke, a Senior, is in 7th place with 175 takedowns in his high school career. All-Time Season Takedowns: Brandon Loehrke, a Senior, made the list in 9th place and 49 takedowns last year and also in 14th place with 56 takedowns this season. February 9, 2019. The W-F Wrestling Team won its Regional with eight wrestlers moving on to Sectionals. Tuesday, February 12th, the Team wrestles at Team Sectionals against one of this year's two top rated teams in the State. February 2, 2019. Central Wisconsin Conference Team Champs for 2018-2019! Congratulations Wrestlers!